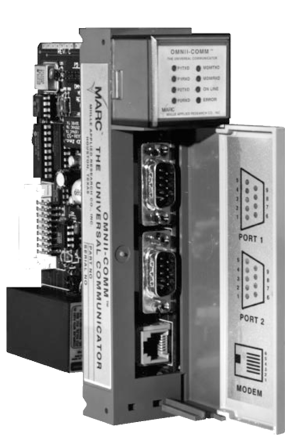 The MARC™Model 166-100 is a full-function modem which plugs into one slot of an Allen-Bradley SLC 500 PLC and provides data communications with other Bell and CCITT compatible modems at speeds up to 2400 baud. The Auto-Answer and Auto-Dial features of the modem allow it to use the public switched telephone network for its communications. Besides providing greater economy and flexibility, this method allows a remote PLC to be accessed from any modem-equipped personal computer for trouble-shooting and program revisions. Powerful test modes include response to remote digital loopback commands issued by Hayes® compatible modems.